Human foosball, the lifelike adaptation of the popular table/arcade game, is quickly catching on as a fun and exciting pursuit for young and old. Whether you play at a family get-together, with friends, or as a way to stress teamwork at a company event, the game can offer hours of exhilaration as well as cardiovascular exercise that can help keep all players involved in great physical shape. The setup costs for human foosball are very low, as the game is very cost-effective. Whether you decide to build your own human foosball court or use an existing playing field of some kind, the fun to be had through this game is almost indescribable. In the following article we will discuss human foosball in great detail, including the history of the game, the type of facilities used to play the game and how to build them, and the general rules and strategies that can help you become a human foosball champion. What Is Human Foosball—and a Brief History? As the name suggests, human foosball is basically the same game as regular foosball, only instead of having little plastic men whirling around on bars it is played with humans—making it a life-sized version of the game. The game of human foosball can actually be played on a court of any size, although in competitions the regulation court measures about 32 feet in length by 16 feet in width. Rods or poles are stretched across the field width-wise, and the human players need to hold onto these rods in set positions. The number of people that can actually play at one time varies, but for a really fun game you will need at least 10 players and a maximum of 18 players. As for the history of the game, nobody really knows—or at least nobody is taking credit. Most people just believe it was the natural progression of regular table foosball, perhaps dreamed up by bored fraternity brothers looking for something to do on a lazy Saturday afternoon. One thing is for sure, however. The game is more popular than ever and is gaining in popularity each and every day. The rules for human foosball closely follow that of the table game of the same name, although they do vary from place to place. In competition foosball, there are seven players to each team—6 players on the field and one goalie. Players are required to keep their hands on the rod in front of them, and can only use their feet to kick the ball. The object is to kick the ball through your opponent’s goal, and the team with the most goals at the end of the game is declared the winner. If at any time the ball is knocked out of the confines of the court, whether it be due to a goal or an out-of-bounds play, the ball is placed back into the middle of the court. It remains in the middle of the court until a whistle blows to resume play, at which time there is a face-off and the game resumes. Teams are allowed to substitute players in an out only when the ball is dead, but players are to continue holding on to the rod in front of them at all times. Overall, a player is free to move in an area measuring only about 2 feet, while continuously holding on to the rods. If you can picture you and 10 of your closest friends or family members holding on to rods and kicking a soccer ball, you already know that the fun to be had through human foosball can happen almost anytime. Human foosball makes for a great game at parties, family reunions, bachelor events, etc. If you run a company or organization, human foosball also makes for a great team-building activity—an activity that forces people to work together towards a common goal. Although the rules of human foosball always remain the same, the court on which the game is played can vary quite a bit. Here we will discuss three types of human foosball: unenclosed foosball, enclosed or custom-built foosball, and inflatable foosball. In human foosball that is unenclosed—picture a grass playing area or gymnasium—the court is marked the same as it would be for enclosed foosball, but there are no side or back walls to stop the ball or hold the rods. In this type of foosball players typically are made to hold onto a freestanding rod, usually a long piece of PVC pipe, and stand on a predetermined place on the court. From there, the regular rules of foosball apply. Unenclosed human foosball is the least popular—and least enjoyable—version of the game. Because there are no walls to block the ball, the game is frequently interrupted when the ball is kicked out of bounds. The lack of walls also takes some of the pace and strategy away from the game. The enclosed or custom built version of human foosball more closely resembles the actual game. As such, it is much more rapid-paced and exhilarating to play than the unenclosed version. In this version of the game, a court must be custom built to the proper dimensions of the field. For example, if you plan to play with 10 people, you must build a court to accommodate that many players at once. The walls for a custom built human foosball field can be made from a variety of materials. For a permanent court, many human foosball enthusiasts use materials like wood or even aluminum to construct the walls, and drill out holes along the side of the court in which to insert the rods. When made correctly, these courts will last a very long time and provide hours upon hours of family fun. Temporary human foosball courts can also be created out of things like hay, PVC pipe and tarps, or any other boundary system you can dream up to keep the ball within the confines of the court. With these temporary enclosed human foosball courts the rods are typically placed on top of the enclosure and secured manually. Anyone can make their own human foosball court just by studying the dimensions of an actual foosball game and creating your own enclosure, rods and goals to scale. 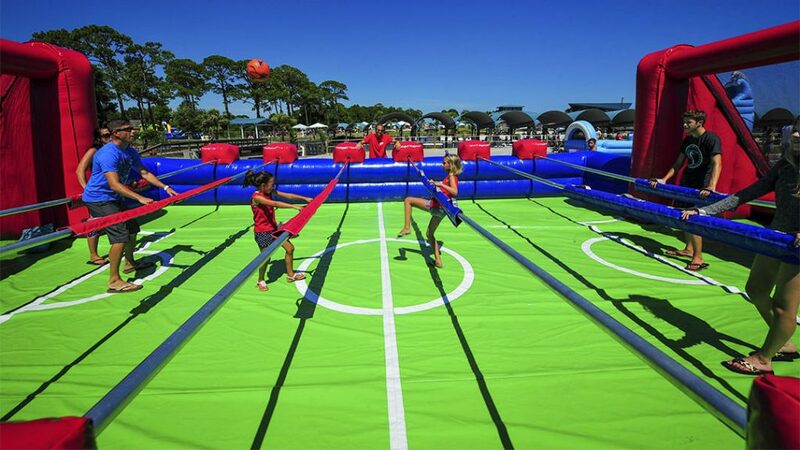 Inflatable human foosball courts represent one of the best ways to play this raucous and fun game. As the name suggests, inflatable foosball courts, which can be ordered from party supply companies, inflate to create a regulation size foosball court with enclosed sides and built-in-rods. The game is played the same way as other types of foosball, but because the field is inflatable there is less chance of injury, making it perfect for children’s birthday parties and long summer days in the neighborhood. Of course, with the inflatable version of the game players will need to take their shoes off so as not to damage the enclosure, so we recommend using a much softer ball when playing this version. Although human foosball is fun all by itself, there are many variations of the game that can ramp up that enjoyment and create a free-for-all that must be seen and experienced to truly appreciate. One of these variations is called “costume foosball.” A great idea for Halloween and children’s birthday parties, costume human foosball is played in the same way as regular foosball; only all of the participants are dressed in their favorite costume. Nothing is more enjoyable than to watch “Batman” trying to score a goal with the help of one of the Teenage Mutant Ninja Turtles through the goal that is being blocked by Barney the purple dinosaur. Another variation of the game that really ramps up the excitement is “Blind Human Foosball.” In this variation of the game, all of the players on the court—except for the two goalies—must wear blindfolds. Instead of looking for the ball, players must feel around and wait for the ball to touch their foot before kicking it. The goalies can yell instructions to their players as the ball gets near them, but no other players are allowed to remove their blindfold. This variation of human foosball is particularly popular as a team building exercise at company retreats, forcing all the players on the field to work together towards a common objective. As you can see, human foosball is a great activity for young and old. All of the rules and strategy are the same as the regular table game of foosball—one of the most popular of all arcade-style games—but with human foosball you get an added degree of teamwork, exercise and human contact. Whether you play on an unenclosed court, perhaps in a gym or a playing field; a temporary or permanent court that is custom built to your specifications; or an inflatable court; the game of human foosball always offers hours of friendly fun and some treasured memories you will not soon forget.